Diana Duncan enjoys writing rhyme and she wanted to write a story with a simple theme about a dog that develops a cunning and amusing plan to deal with the school bully who is making his young master's life a misery. It prompted her to write “Abe to the Rescue” (published by Partridge Singapore). The book tells the story of Charlie, a young boy who chooses a puppy called Abe although his uncle tells him the puppy is shy and not confident. Abe and Charlie become fast friends. One night, Abe decides to put a cunning ‘doggy plan’ into action when he overhears Charlie telling dad that he is being bullied at school by a boy named Garth. Abe works out a cunning plan to rescue Charlie from the school bully. 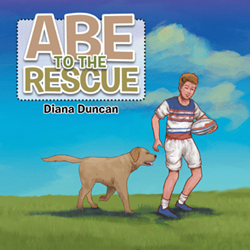 “Abe to the Rescue” shows readers how animals can teach people some important lessons about life and the power of love and courage. Abe passed wind loudly; what a din. Closing it behind him with his paw. Diana Duncan is formerly a secondary school English literature teacher.